Signed l.l. corner, grey oil "G P [monogram]. Nerli". Not dated. Peter Entwisle, Nerli - An exhibition of paintings & drawings , 'G.P. Nerli: Influences in Australia', pg. 28-38, Dunedin, 1988, 34, 112, 113, 114 (illus.). The golden age of Australian painting - Impressionism and the Heidelberg school , Melbourne, 1969, 31 (illus.). 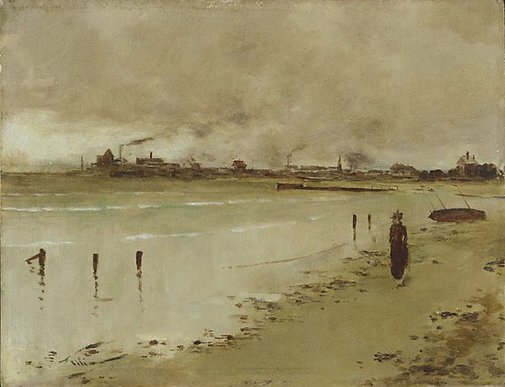 titled 'The Beach at Port Melbourne from the Foreshore of St Kilda'.